With quality and innovation as our driving forces, we have always aimed for total customer, satisfaction. We are one of the pioneer cashew processors in India to be accredited with the prestigious ISO 22000:2005 FSMS quality certification. Exhibiting excellence in all our operations, we make sure that each of our products reflects quality excellence and the best taste. We deploy latest technology in all our quality checking processes and ensure that hygiene is maintained at all levels. Quilon Foods Pvt. Ltd. was one of the first to start the flexible packaging system in cashews in India, which by now has been acknowledged as one of the best innovations in the cashew industry. We have introduced sophisticated machinery like vibratory separators, vibratory aspirators and also metal detectors in our packaging line to assure that only the best cashew goes into our packing. Quilon Foods Pvt. Ltd’s insistence on quality, excellence and timely delivery, has ensured itself a market among the quality conscious consumers of the USA, UK, Japan, UAE, Germany, Singapore, The Netherlands, Australia and New Zealand. 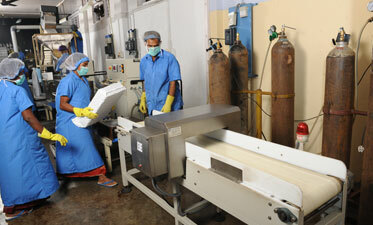 The professionally qualified quality control team at Quilon Foods Pvt. Ltd. conducts frequent entomological surveys at all processing and packing centres and quality testing before each shipment, ensuring that only the very best cashews are made available to our customers. "We accord the highest priority in maintaining the best quality and hygiene standards. Utmost care is taken to ensure that uniform quality is maintained right from procurement to processing and delivery. No effort is spared in making sure that the best hygiene practices are implemented throughout all operations."